This is James Howell, author of the République Manifesto, and I’d like to offer insight into the relationship between the Manifesto and the game itself. 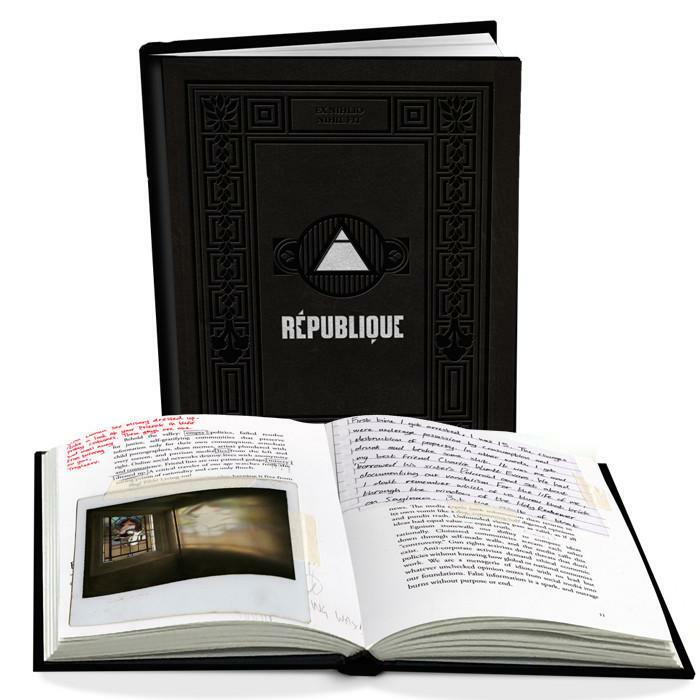 I typically believe that writing should be represented only by itself, so I avoid anything resembling an artist’s statement; however, République has always had a public element that most art does not, so I am breaking my habit to elaborate upon the book’s design. The Overseer’s Manifesto is a full complement to the game, right down to its narrative flow. The pairing between Chapter 4 and Episode 4 is perhaps the strongest example of that mirroring style. The Manifesto indirectly explores Hope’s heroism by showing how The Overseer failed a moral test that Hope (and the player) passed. I saw Episode 4’s theme as “dissociation.” As players, we are often encouraged not merely to identify with our game protagonists but to identify as them. République differentiated Hope and the player at its outset, but that line blurred as Hope’s presence became familiar. Episode 4 reminded players what we knew all along: Hope can (and does) go her own way. After the reunion, Mireille observed that Hope’s success was a result of her having help, which Weep lacked. The dissociation healed; the player’s presence was justified, and Hope reaffirmed her trust. The Manifesto mirrors this pattern, but The Overseer (known informally as “Cir”) reaches a different conclusion. When I started the République Manifesto, I never wanted Cir’s “break” with reality to take hackneyed forms of supervillain madness, such as hearing voices, hallucinating, or behaving in arbitrary, maladaptive ways. I wanted him to have an intellectual’s fall, so he lost his humility in the search for truth and believed absolutely in his own ideas. As an internally cohesive work, the République Manifesto’s macro-narrative traced Cir’s growth from a man grounded in the concrete, such as his beginnings under specific historical circumstances, to a futurist who wants to control history. The first three chapters built Cir up as a man responding to history, as it described his struggles to assert his will amid circumstances behind his control. In Chapter 5, Cir retreated into a transhumanist dream that overthrew the premises of all his sufferings—societal patterns, the mystery of why someone is born in a specific place at a specific time, and human psychology. The turn happened in Chapter 4, and the Manifesto mirrored Episode 4’s dissociation through literary form. “Dissociation” implies a unified prior identity. The République Manifesto cultivated Cir’s identity through voice and genre. He wrote with a first-person voice, and he used the grounded genres of historical narrative and rational argument. After the République Manifesto established these conventions, Chapter 4 broke from his voice and genres to convey his internal break. Prior to Chapter 4, Cir wrote the text as himself—author and editor both. Even though his mode was didactic, he existed in a headspace of self-correction. He accepted the writer’s responsibility to cure the work’s defects and make it true. Even as a demagogue, he had a moral core that adjusted itself to the needs of the present world. Mental unity also requires understanding oneself in context, as a person relative to events and other people. The first three chapters gave Cir this context. He worked his way through historical time in his biography, and he responded to shared, contemporary problems through semi-rational argument. Chapter 4 opened with narrative context, starting at a place (Sacramento, CA) in time (1988). Cir then explicitly retreated from identifying things as they are. He explained the loose relationship between signifiers and signifieds, and he showed a willingness to exploit that looseness to undermine others. His historical cohorts were real people, but he presented them through pseudonyms. Things separated from their names. He dissociated further by ceding the first-person voice and adopting a third-person genre: the dialogue. He was present, but voices in conflict overtook the chapter. Violence was threatened before the exchange reached cadence, after which the chapter shifted to another detached genre, the dramatic monologue (dressed up as a TED talk). Cir was pulled inside out. He aligned himself with a philosophy called “reductive materialism,” which regards subjective experience as reducible to objective, material phenomena. (Emotions, for example, are regarded as chemical events.) He was no longer a subject, but an object, and his ideas became “objective” as well. He made any thinker’s worst mistake: he listened to himself and wholeheartedly believed what he heard. Cir returned to the first-person voice in Chapter 5, but he remained detached from history and the human condition. He announced his desire to correct history and humanity, using his egotistical values as a standard. He saw reality itself as an object to manipulate. His language leaned away from technical description and toward abstract images. Cir abandoned the accessibility of first- and third-person narration to become the most confusing kind of person: a poet. As a complement to the game, the République Manifesto gave Cir a path similar to Hope’s but with an opposite outcome. Episode 4’s separation ended with an affirming reunion. The player and Hope looked to each other as partners. At the end of Chapter 4, Cir found a partner only in himself. I wanted to show how Hope triumphed over Cir’s failings, and, to do so, they needed to undergo the same challenge with different results. In the République Manifesto, the Overseer failed a spiritual challenge that Hope overcame, establishing Hope as heroic even amid the ambiguities and moral compromises of République’s world. Physical copies of the Manifesto went out to République‘s loyal Kickstarter backers, but the text is still available through iTunes.